A few weeks ago, while visiting the National Archives in Washington, D.C., I had the privilege of viewing the original Declaration of Independence, Constitution, and Bill of Rights. The penmanship in the Declaration of Independence should be quite familiar to most Americans, as they've probably seen it dozens, if not hundreds, of times. But viewing it in person, I was taken by the handwriting style of the documents, which were produced with just a bottle of ink and a feather quill pen. It's a style that falls into today's typeface category of Script. I mistakenly assumed that the penmanship belonged to Thomas Jefferson, the acknowledged author of this great work. 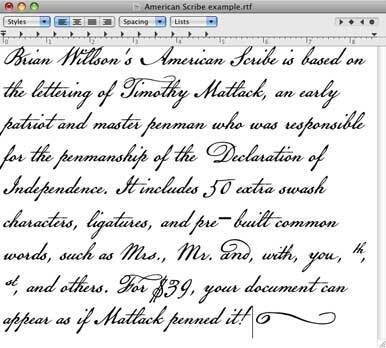 As it turns out, although Jefferson was the author, the final document (and many other important documents of the time) was actually penned by Timothy Matlack, an early patriot and master penman. The American Scribe typeface replicates the script found in the Declaration of Independence. Because Matlack's lettering can be found on so many documents, it was possible to create a digital version of it as a typeface we can all use. And that is exactly what type designer Brian Willson did: his American Scribe typeface ($39) lets you generate your own Declaration-like documents, posters, movie titles, and so on. While there are a great many script typefaces available, most of them have characters that do not connect to each other—probably because script faces that connect are far more difficult to design. However, the characters in American Scribe do connect, which gives it the appearance of having been written by hand. When using it, you'll want to be careful not to use the tracking controls in your page layout application, otherwise the characters will break apart from each other and ruin the effect. In addition, Willson added 50 extra swash characters, ligatures, ink spatters, and pre-built common words, such as Mr., Mrs, this, that, shall, by, which, several withs and ands, and others. By swapping those extra glyphs into your projects, you can give them an even more customized appearance without the tedious work of crafting them yourself. 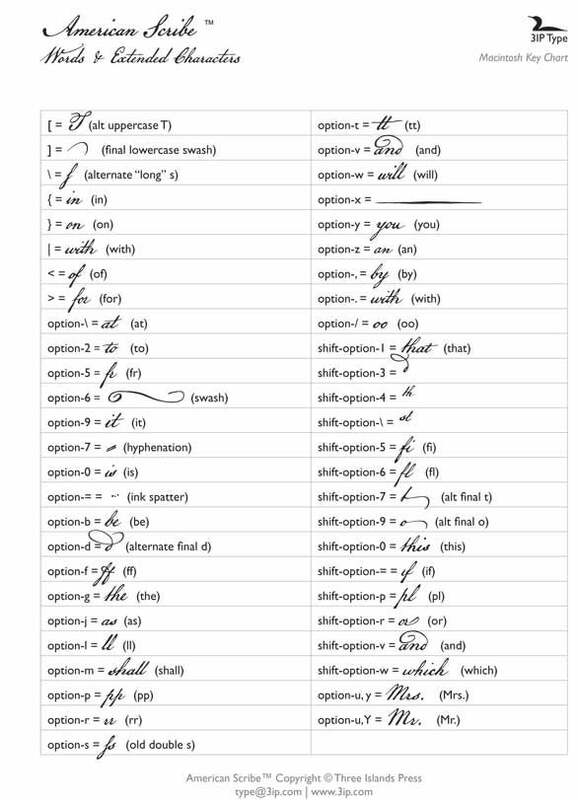 Here's a chart that's included with American Scribe, showing you how to access each of the extra glyphs. American Scribe includes this chart of extra glyphs, and the keystrokes necessary to use them. There are dozens of type foundries with many other script fonts that contain extra characters. But here's the real shocker: some of the fonts already on your Mac contain special glyphs that you can use—if you can find them. Fortunately, Mac OS X includes a sophisticated type-handling system, and its front end pokes into your applications in surprising ways. For example, in Apple's Font Book utility, there is a Repertoire view under the Preview menu. If you use professional design tools such as QuarkXPress or Adobe Illustrator or InDesign, you'll find a Glyphs palette within these programs that gives you direct access to every glyph. Just double-click to insert one into your text. The Repertoire window in Font Book shows all the glyphs in any font. Open it under the Preview menu. For fun, explore Apple Chancery, Zapfino, or the thousands of glyphs in Lucida Grande. One way to make it easy to access those extra glyphs in other applications is to install a utility such as PopChar X, from Ergonis Software. This utility adds a little icon to your menu bar. When you click on it, an advanced glyph display appears that shows the keystrokes required to type any character, and lets you click to insert any available glyph into your current document. 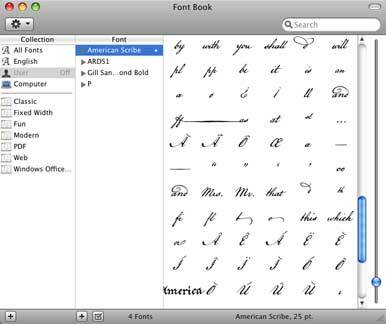 Just like many things on your Mac, the font tools are far deeper than you may imagine. Exploring them, and your fonts, is one of the great joys of using a Mac.